I still make hot crash potatoes almost every time I get small, waxy potatoes from Boston Organics, but this time, I wanted something with a little more kick. 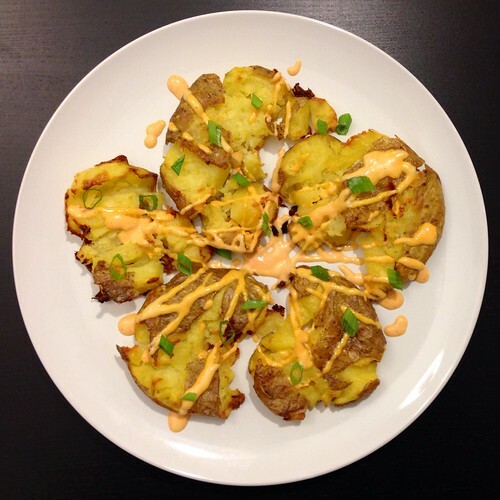 So I made a quick sriracha mayonnaise and drizzled it on the finished potatoes along with a sprinkle of chopped scallions, and tada! 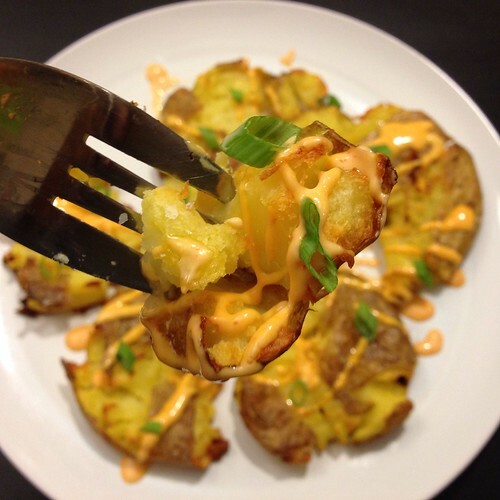 Hotter crash potatoes! I also took a suggestion from one of the comments in my original post to microwave the potatoes instead of boiling them first. The result is basically the same but in a quarter of the time! Place the potatoes in a microwave-safe bowl and cook for 5 minutes. Check for doneness; if a knife pierces through the potatoes easily, it's done. If not quite done, cook for another minute or two until done. Line a sheet pan with aluminum foil or a Silpat. Drizzle generously with oil. Transfer the potatoes onto the oiled pan and smoosh with a potato masher or slotted spoon or large fork. Crowd the potatoes close to each other and carefully drizzle more oil on top, making sure that almost all the surfaces are covered with oil. Sprinkle with a few generous pinches of kosher salt. Bake for 20-25 minutes until golden brown. In the meantime, mix the mayonnaise and sriracha sauce together to make sriracha mayonnaise. 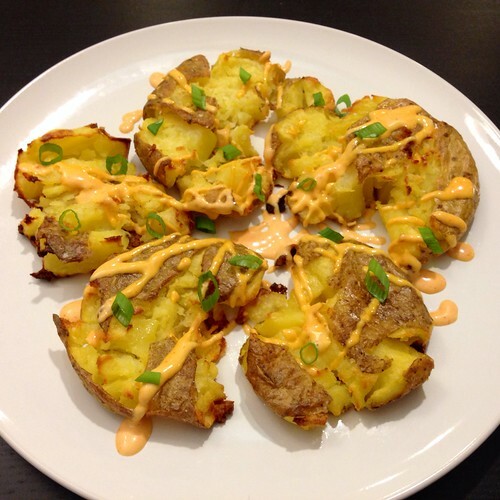 When the potatoes are done, plate and drizzle with the sriracha mayonnaise. Garnish with a healthy sprinkle of chopped scallions. Serve warm. Last week I received a head of cabbage in my Boston Organics delivery and didn't really know what to do with it until I remembered that it's a main ingredient in okonomiyaki. I'd never had it before, so I'm not sure if what I made is particularly authentic or not, but it's a perfectly delicious way to use up a head of cabbage! 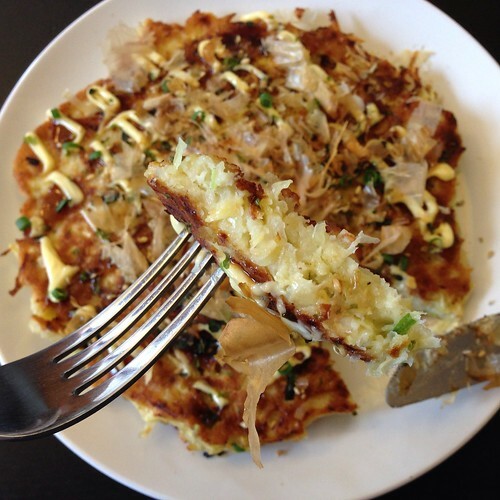 Okonomiyaki is a savory Japanese pancake that you can pretty much put anything in. The name itself means "what you like" and "grilled". I loosely followed this recipe except I used bacon for the meat and substituted panko crumbs for the tempura flakes since I didn't have any of the latter. I also subbed in 2 tablespoons of tapioca flour for the all-purpose flour to make the pancake more tender. There is a traditional okonomiyaki sauce that is very similar to tonkatsu sauce--think tangy, slightly sweetened soy sauce. I didn't have any on hand, so I just used soy paste mixed with some ketchup and Worcestershire sauce as suggested by my findings on-line. If you have Japanese-style kewpie mayonnaise, I suggest using that, but otherwise regular mayonnaise would work. The other toppings I added were chopped scallions, nori komi fuikake (Japanese rice seasoning with seaweed flakes and sesame seeds), and bonito flakes. Feel free to use whatever you want and get creative! Mix the flour, salt, and dashi stock or water together to make the batter. Let rest in the refrigerator for an hour and up to 24 hours. If using the bacon, cook over medium-low heat until the fat starts to render out but before it starts to brown too much. Remove the bacon and set aside. 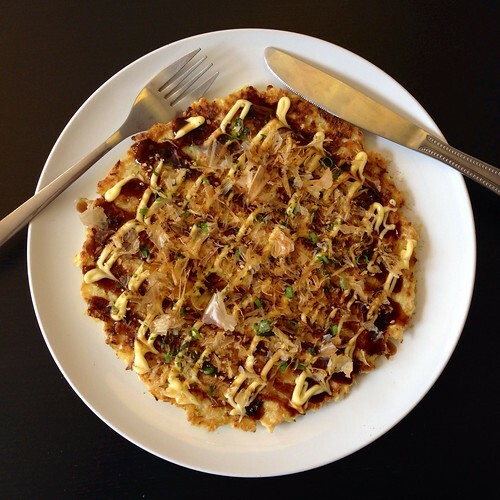 You can save the bacon fat to cook the okonomiyaki in. To make one pancake, take half the batter (about 1/2 cup), 1/4 lb. 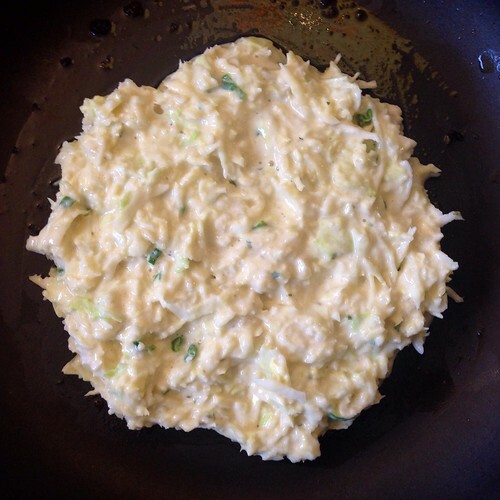 shredded cabbage (about 1 cup), 1 tablespoon scallions, 2 tablespoons panko or tempura flakes, and 1 egg and mix together. Start heating a tablespoon of vegetable oil in a frying pan over medium heat or use the bacon fat left over from cooking the bacon. 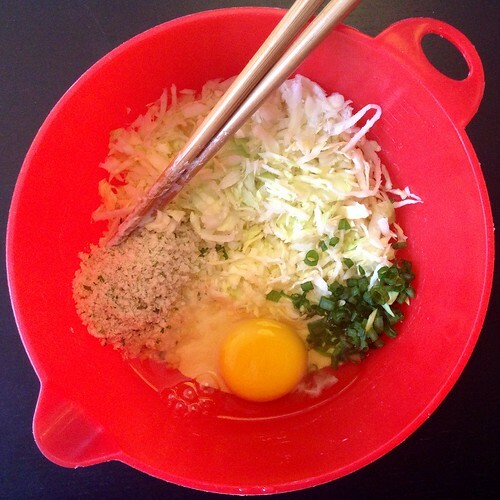 Once the pan is hot, add the okonomiyaki batter and form into a circle. 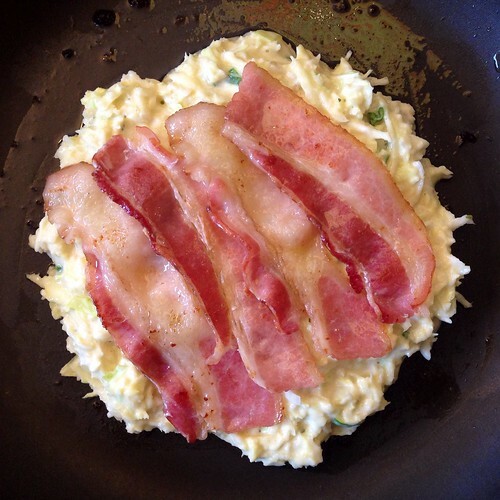 If using the bacon, arrange half the bacon slices on top of the (uncooked side of the) okonomiyaki. Cook for 5-6 minutes on each side. 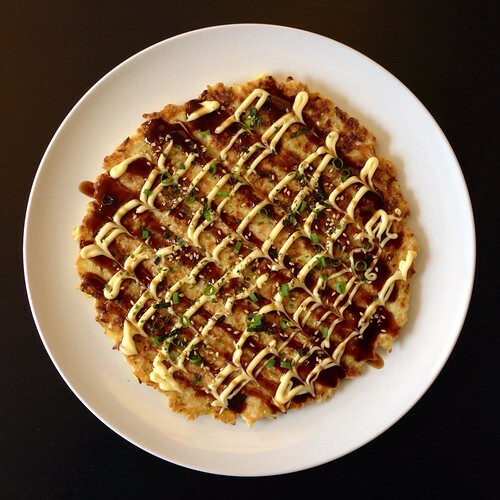 Plate the okonomiyaki and drizzle the okonomiyaki sauce (or equivalent) and mayonnaise on top. Sprinkle with some chopped scallions, nori komi furikake, and bonito flakes, or whatever you like. Serve warm. The bonito flakes are so thinly shaved that the steam rising up from the okonomiyaki will make it look like it's dancing. It's kind of creepy if you've never seen it before because it looks like it's alive, but once you get over that, it's pretty cool. This pancake kind of reminds me of Korean pa jeon except there's less of a moist batter and more of crunchiness from the shredded cabbage. Last year for Valentine's Day I celebrated by making jjajungmyeon (Korean black bean noodles). This year, I stayed with the color scheme but went Italian and made squid ink spaghetti aglio e olio, inspired by my trip to Venice. 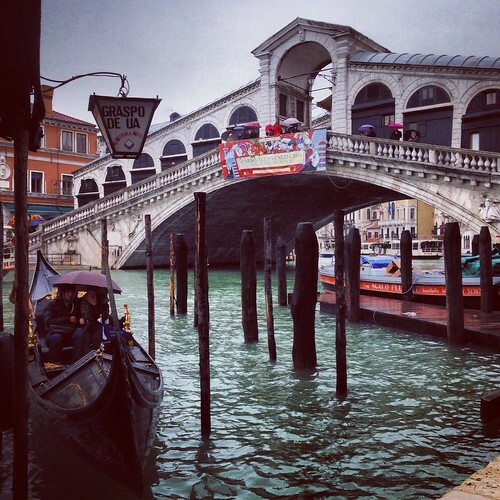 After our time in Rome, my cousin Leslie and I took the train up to La Serenissima. 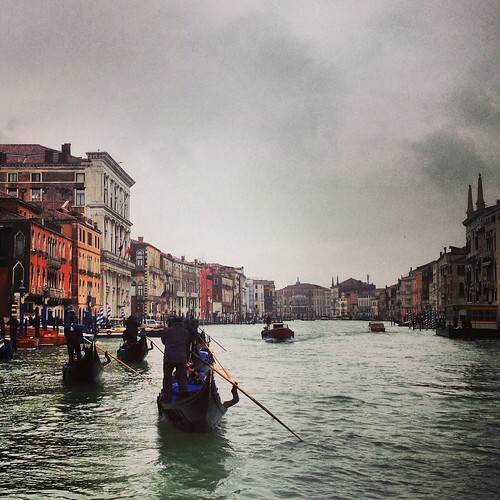 Despite being colder and rainier than Rome, Venice was amazing. At just about every bridge we crossed, I felt like I had to stop and take a picture; it was so picturesque! 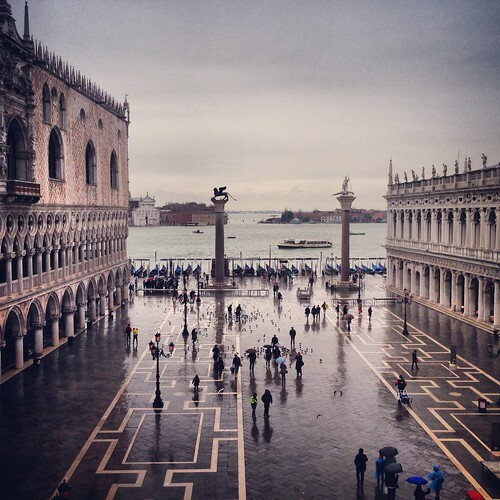 We spent the first half of our trip either using the complimentary hotel shuttle boat to St. Mark's Square or trudging through the rain on foot to get around. The city wasn't that big, so we were able to see St. Mark's Basilica, the Doge's Palace, the Accademia, and Rialto Bridge pretty easily this way. It wasn't until we decided to get a pass for the vaporetto (the public water bus), though, that I really began to feel like more than just a tourist. 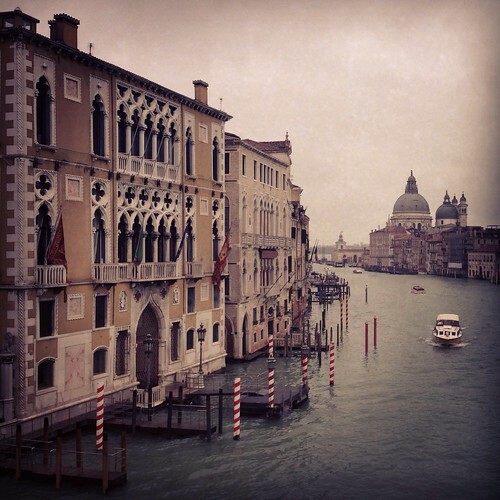 At last we were able to see Venice from the Grand Canal as it was meant to be seen. It didn't hurt that we were usually surrounded by locals commuting back and forth from work, either. 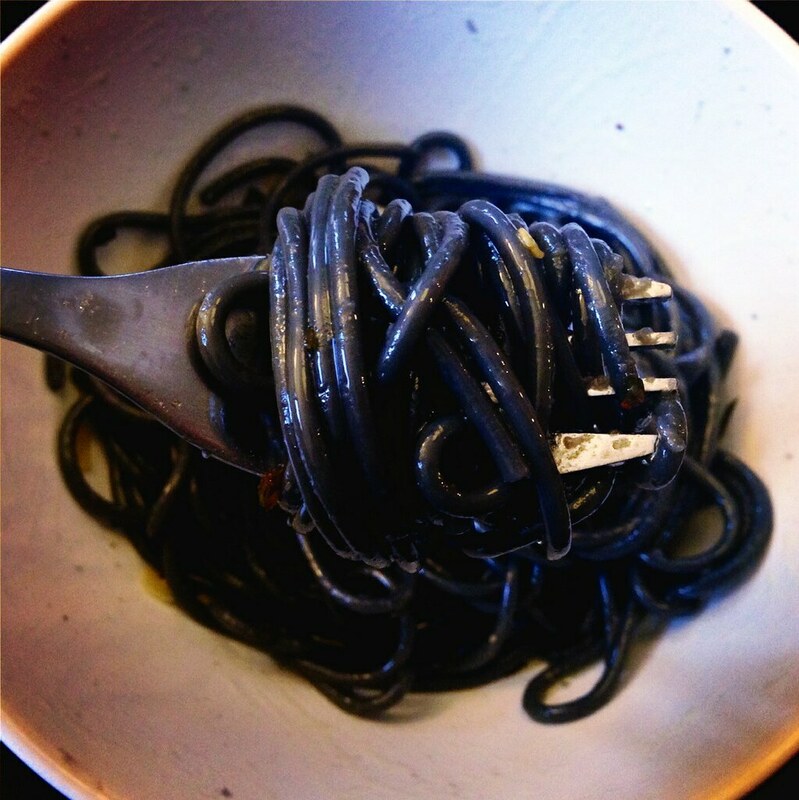 While scouring the grocery store on the last day for edible souvenirs to bring home, I found a package of spaghetti al nero di seppia, or squid ink spaghetti. I had ordered spaghetti with cuttlefish ink sauce a couple of times in Venice a couple of times and really enjoyed it, so I decided to buy the pasta and try to make it at home. 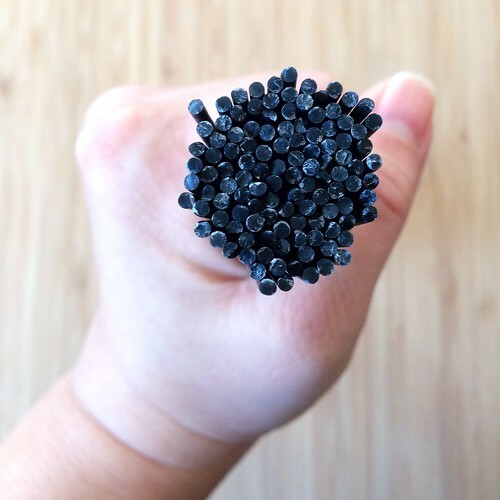 Unfortunately, I haven't been able to find any actual squid or cuttlefish ink to make the sauce with, although in my search I did find squid ink pasta at a local Italian store, so you probably don't have to go all the way to Venice to find the pasta. Without any ink, I decided to prepare the pasta simply, aglio e olio, with garlic and olive oil and a pinch of red pepper flakes. This recipe is even easier than spaghetti carbonara and you're almost certain to already have all the ingredients (you can use regular spaghetti if you don't have any squid ink pasta). Bring a pot of salted water boil. Add the spaghetti to the pot and cook according to the packaging (mine says to cook for 10-12 minutes). In the meantime, add the olive oil and sliced garlic to a small saucepan and set on low heat. Once the garlic starts to sizzle, add the red pepper flakes and sea salt to taste. Continue to heat while the spaghetti is cooking, but do not allow the garlic to brown. If this starts to happen, remove the pan from heat. When the spaghetti is done cooking, use a pasta scooper to add it to the saucepan. You want a little bit of the pasta water to go along with it so don't worry about draining it first. Toss the spaghetti with the olive oil until it is well coated. Plate and garnish with some chopped parsley or basil. Serve immediately. 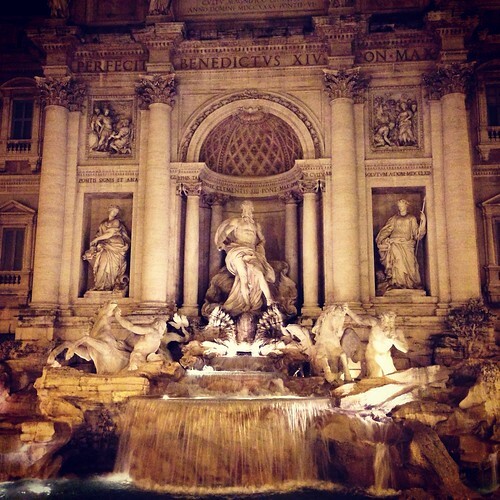 I just got back from another trip to Italy! 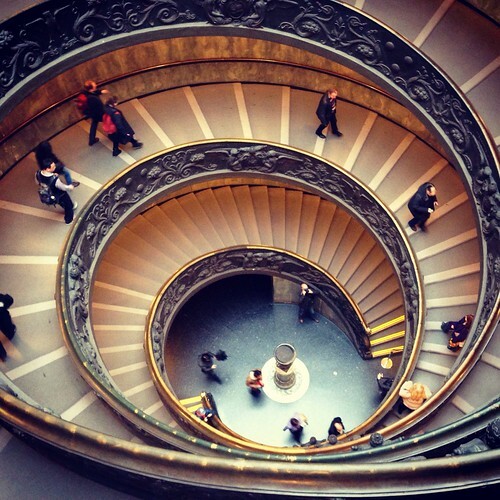 A couple of weeks ago, my cousin Leslie asked me if I'd like to join her on a business trip to Rome and after a quick check to see if I could fly there using my miles, I happily accepted. 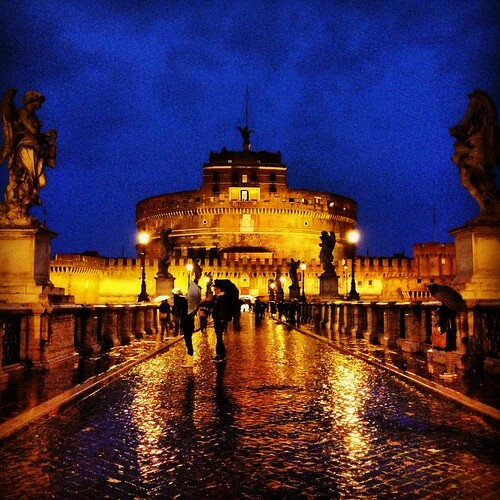 Rome in winter is quite different from Rome in the summer. For one thing, there's a lot less people, meaning less or no lines for attractions. Piazza Navona was basically deserted, and I had a hard time explaining to Leslie what was so magical about that square in the summertime. The weather was in the 50s and rainy, but it didn't stop us from eating as much gelato as we could. I was able to revisit Grom, Il Gelato di San Crispino, and my favorite, Gelateria del Teatro (where I had to have the rosemary honey & lemon flavor again). We also tried the gelato at Fatamorgana, which is supposedly the gelateria that started the whole natural ingredients trend. 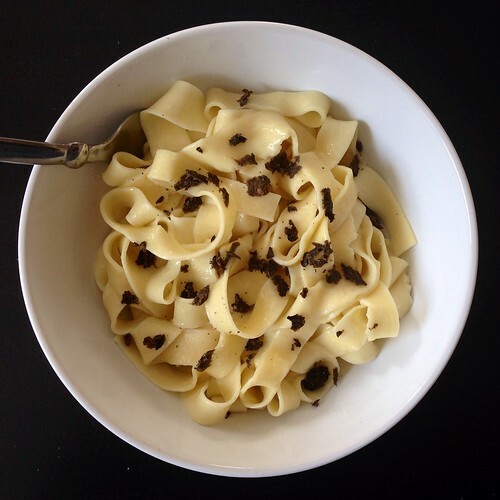 I ate a lot of pizza and pasta, some better than others (the pizza at the cafeteria in the Vatican Museum was surprisingly good, but that might be because I was hungry), but the best dish I had all vacation was the tagliatelle al tartufo bianco from Piccolo Arancio, near the Trevi Fountain. It was the most expensive pasta on the menu, almost double the price of all the other pastas, but it was so worth it. 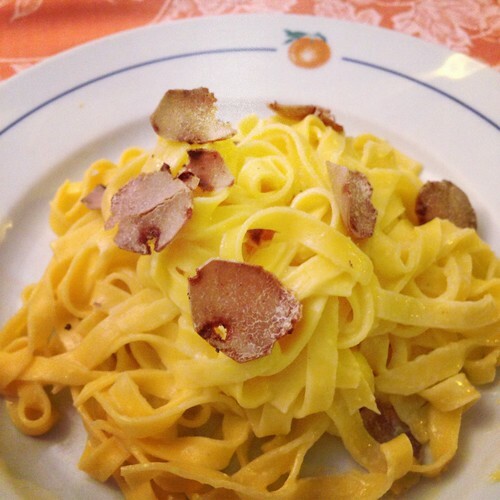 The tagliatelle must have been freshly made, and you could taste the eggs in the dough. They were cooked to a perfect al dente and simply dressed with some salt and butter so that the white truffle flavor could shine through. It was definitely one of those dishes that make you stop and say grace again because it's just that good. Naturally, I had to try to replicate it at home. 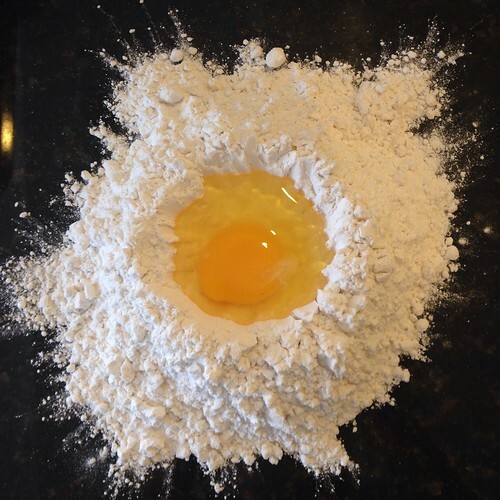 Crack the eggs into a well made in the middle of the flour. Using a fork, gently beat the eggs and gradually draw more and more of the flour into the mixture until it forms a dough. Knead the dough for several minutes until it is smooth and elastic. Cover and let rest while you go find your pasta maker and set it up. Cut the dough in half, covering the half that you are not working with. Roll the dough through the largest opening of your pasta maker, fold in half and repeat at the largest setting several times until the dough is nice and uniform. At that point, start decreasing the size of the opening each time after you roll the dough through (without folding the dough in half in between). Stop when you reach the second smallest opening. Fold the long strip of rolled dough into thirds and then one or two more times on the same axis so that you you have a manageable length to cut. 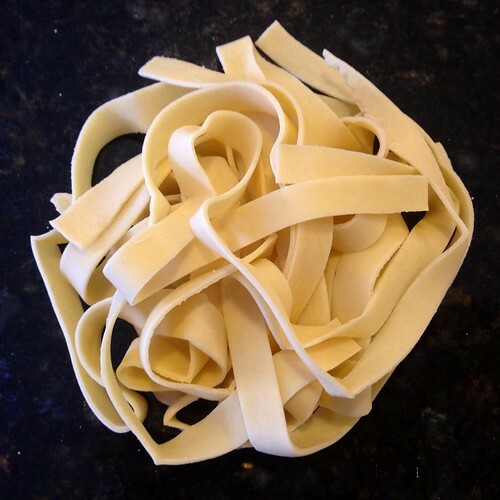 Cut the dough into quarter-inch strips and unroll the noodles. Repeat the rolling and cutting process with the other half of the dough. Let the noodles rest and dry a bit while you boil a pot of salted water. Cook the noodles in boiling, salted water for 3-5 minutes until al dente. Drain the water, leaving the pasta in the pot. Add the butter and salt and pepper to taste. Toss the pasta in the pot until the butter melts and coats all the strands. 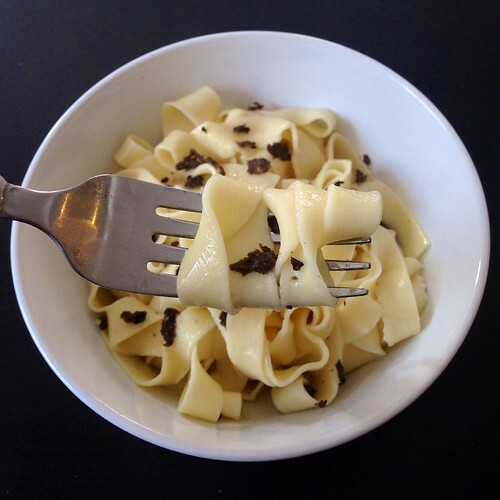 Plate the pasta and shave some truffle on top. Serve immediately. Sadly, mine doesn't look nearly as good as the dish I had a Piccolo Arancio, but I think it tastes almost as good!